Congrats on your progress to date! Do you have a target complete date? Thanks! It’s been a long journey so far, but I’m finally starting to see the progress pay off as two of my loans are now gone, and hopefully a third will be gone later this month. It was also big news for me getting my private loans refinanced at a lower rate. At my current pace, I’ll be debt free hopefully by the middle of 2016 but I don’t think that will happen. I plan to move out hopefully later next year (possibly sooner) so my pace will slow down a bit. A more realistic goal is is probably late in 2017 but for now it’s more of a moving target! How do you track your loan amount for the month? Do you use your account statements or pick a date within the month? Also, congratulations on all the progress! Way to keep working toward your goals! What I do is just use the online account statements after making a payment. I had payments due on the 9th and the 21st of the month. So I’d make the payment on the 9th, and then say on the 11th or 12th when the payment actually shows up I’d update the loan balance in my spreadsheet. Same idea with the payment on the 21st. Then I’d just take the difference between the balance of last month and this month and that’s how much principal I paid down. You could do the same thing with the paper statements, but obviously your results would just show up a little later. that’s an impressive amount of debt destruction! I’m curious why you paid off some of the higher interest rate debt first. Are you maxing out any retirement plans simultaneously? Since pretty much all my student loan interest rates are down in the 4% area and after tax deductions is more like 3% I’ve decided to try to max out my retirement accounts for now. I did pay off one 6% interest student loan, looks like most of your loans were way more expensive with higher interest rates than mine. Thank you! 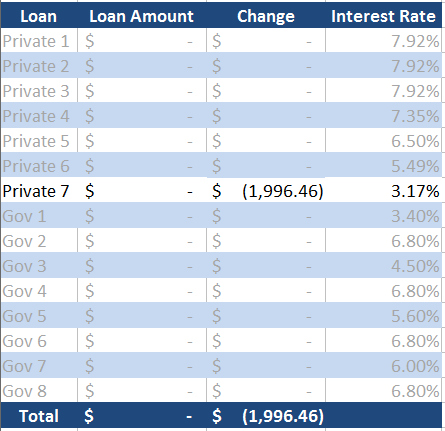 Paying off the highest interest loans will always save the most money in the long run, and I also refinanced my loans twice which brought down the interest rates twice. I’ve maxed out my IRA the past two years too. For my 401k I’m just contributing for the company match. When you have low interest rates, I agree that it can be better to invest your money instead. Usually the market will end up beating the interest rates on your loan so I think that’s a good idea. I meant why you paid off some of your lower interest loans first, or it appeared that you did, but now I’m guessing that answer lies in the refinancing. Sounds like we’re on the same page. My company offers a SIMPLE IRA, and I too have only been doing the company match but I did some calculations last week and it looks like the tax benefits are good enough that I can probably max out for this year yet. I Also have maxed out an IRA the last two years(roth). This is really just my second year of getting serious with investing. I had to think about it because I didn’t want too much in funds I can’t touch for 30 years but It looks like there are ways to convert to a roth. Yeah that has been my plan with low interest loans, bank on the market. Ohh, I understand now. I actually did end up paying off a few of the lower interest government loans too, though it was after refinancing my private loans the first time. I wanted to lower my monthly payments and it was nice to knock another loan out of the way. So I didn’t 100% always pay the highest interest loans. I’m also in a similiar situation, this will be the 3rd year that I (hopefully) max out my Roth IRA. Can’t really afford to increase 401k contributions with my current debt situation though. I thought the same way at first, but there are ways to get that Roth IRA money sooner rather than later. And if really does look like early retirement becomes a feasible option, you can just go all out on taxable investments those last few years of working.